Welcome to Meme Monday, where I unbox a new Memebox and give my thoughts on it. 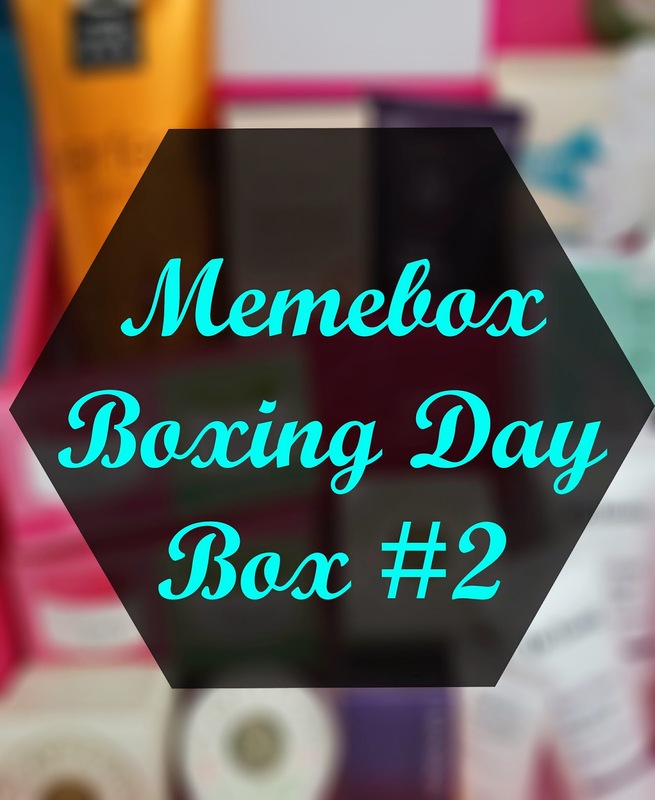 Today, I will be unboxing the Memebox Boxing Day #2 box. This box came with deluxe miniatures and 1 full size item at the cost of $12 plus $6.99 shipping. I have to say, this is by far my favorite Memebox ever! Your probably thinking 'wait, a box of samples is better than their box of full size products?' My answer would be yes, in this case anyways. Not only is the box of goodies more than worth the $18.99 price tag (that includes shipping), it's also the great variety, usability, and quality of all the products. Seriously, this box is amazing and I kind of wish I purchased 2 of them. When the box first came out, I was hesitant to buy it. It could have swing both ways and I was afraid it would be a dud. However, I decided to do a little research and look at past Memeboxes and deluxe samples they had offered. I came out with a list of possible deluxe samples they could include in this box. The more I looked at that list, the more I realized how this box might just be worth it. I had hoped for several products to be included in this box, and all but 1 made it. So I am very happy with that. I had a feeling that this would be one of those "clear the warehouse" type of boxes, and not all "clear the warehouse" type of boxes are amazing. However, this would be an exception and I hope Memebox would make more boxes like this one in the future. 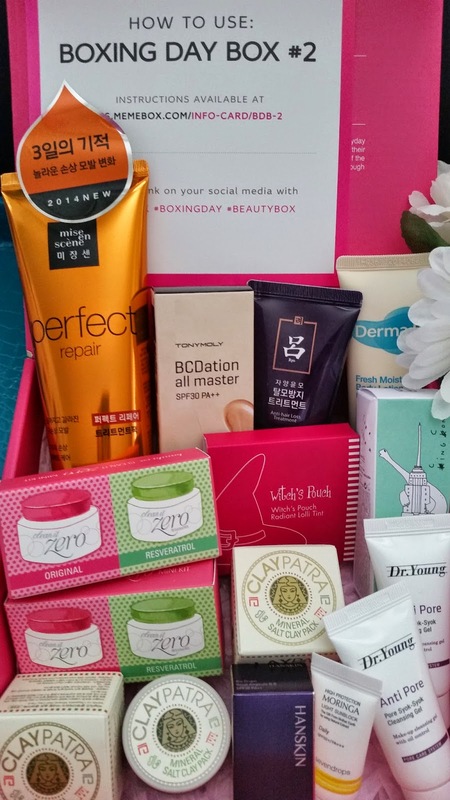 Now, let's dig into this Boxing Day #2 box and get to know all these goodies! Product Description: A nourishing hair treatment pack to deliver deep nutrition to the hair by repairing and protecting them from damages. It can be used twice per week. Apply this treatment after you've shampooed the hair and rinse after 2 to 3 minutes. My Thoughts: This is the full size product included in this box and I have no complaints at all. I LOVE this hair treatment pack. It smells amazing. Plus the scent lasts all day, which is wonderful. I got my first one in my Miracle Mask box, which I didn't end up blogging about because I had 2 damaged products and the box was soaked. I was so upset over it that I didn't take any pictures of it at all. I did get points for the damaged products though, but still. It wasn't an impressive box or anything either, so I didn't mind not blogging about it. The only good thing that came out of that box would be this hair treatment and maybe that vanpir water mask. Product Description: A very nourishing body lotion infused with tea tree, peppermint, bergamot, ginger and amber notes in a refreshing herbal blend. 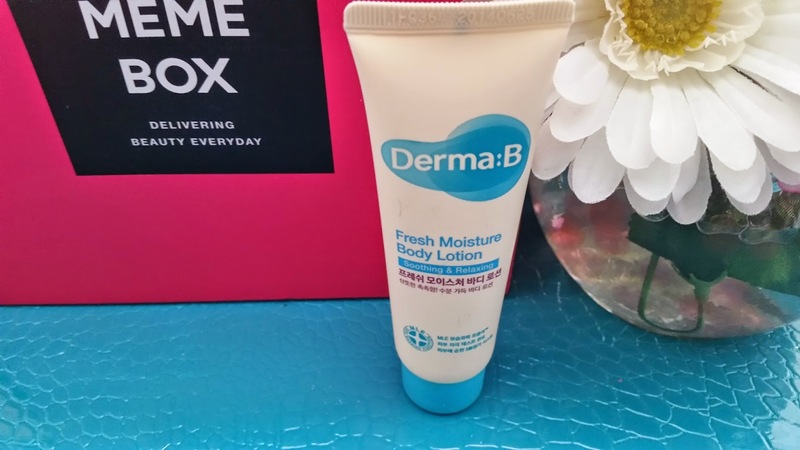 This lotion has a gentle formula for dry and sensitive skn types. It's a non sticky substance that's also fast absorbing as well. To use, take an appropriate amount and massage all over the body after shower or before going to bed. My Thoughts: I got this product in my Green Food Cosmetics box before, the same sample size. I think this would be great for traveling, since the size is perfect. It's recommended to be stored in a fridge, although I think I'm just going to keep mine somewhere cool for now. To me, this lotion smells really pleasant and its herbal blend is perfect for keeping the skin moisturized. Product Description: A gel type cleanser that works great at cleansing the dirt, excess oil, and impurities out of pores. It's formulated with a blend of morus bark, agrimonia eupatoria root extracts, and lime extracts to help control sebum and provide pore care. This gel cleanser is lightweight, oil free, and moisturizing. To use, create a lather on the palm of your hand and gently massage it onto the face. Rinse off with lukewarm water after. My Thoughts: I also got this duo sample gel cleanser in my Wonder Woman box. Like the body lotion above, these are great for traveling. 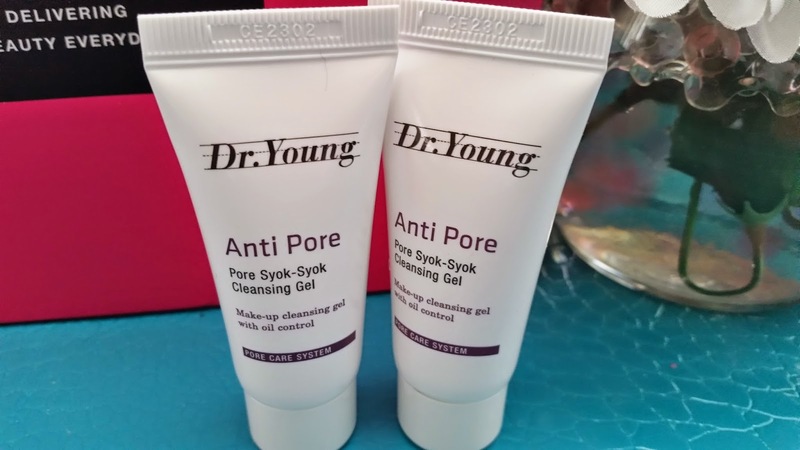 I have started to patch test this to see if my skin likes it or not, since I've got 4 sample sizes of these now. My skin is going through a mini crisis right now because it's that time of the month and I had recently ran out of my cleanser. So I'm trying to find the next best cleanser. For now, I'm using my DIY oatmeal cleanser to soothe my skin while clearing some break outs due to my allergies. Product Description: A Hanskin favorite and famous product, this Royal Ampoule BB cream is packed with nutrients from royal jelly extracts. 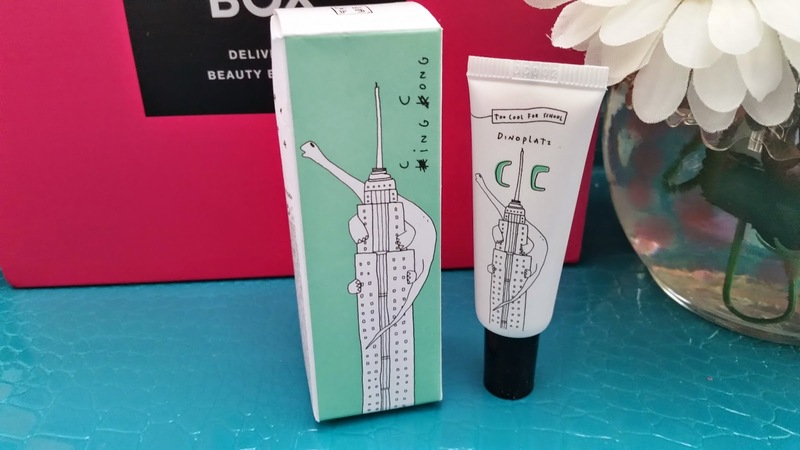 It's gentle formula glides on lightly when you apply it to the skin. Leaving the skin silkier and with a brightened complexion. To use, apply a single drop of the ampoule BB over clean face and blend it in using your fingers. My Thoughts: I had hoped that this sample would be included in this box and it is! 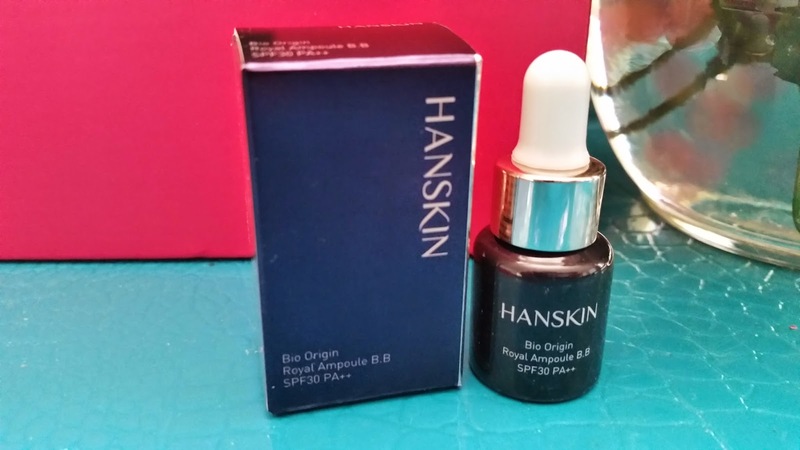 I have heard so much great things about this ampoule BB and really wanted to try it. The sample bottle is tiny, so I think I might only get 3 to 5 uses out of it. Maybe more if I get lucky or less if I'm unlucky. I have tried this once already and the only issue with this ampoule BB is that it lacks coverage. With my skin currently in its mini crazy mode (it's that time of the month) I definitely need coverage in some areas, and this doesn't cut it. Product Description: A hair loss treatment formulated with biota seed, coix seed, green tea, and gold extracts. 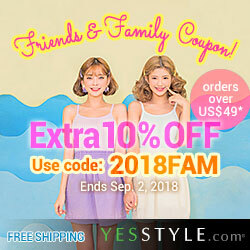 It works to prevent hair loss and re-energize as well as strengthen thin and damaged hair. This treatment has an excellent cooling formula that will soothe and nourish the scalp. To use, take an generous amount and apply it over wet hair. Massage the scalp with your fingertips and wait for 2 to 3 minutes before rinsing off. It can be used daily. My Thoughts: I'm don't think I need this product. 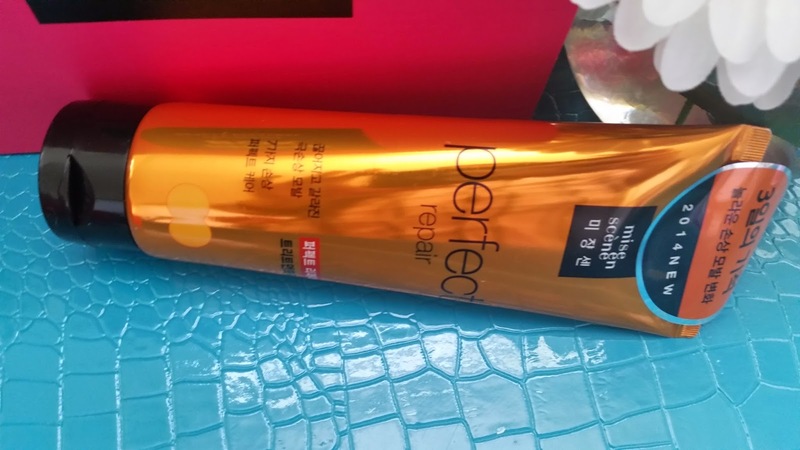 Especially with my new found love for Mise en Scene's hair treatment, that not only smells amazing but also works well on my hair. I think I will be giving this Ryo hair treatment away. Product Descripton: A 3 in 1 lip product that works by bringing together the glossiness of lip glosses, the blending formula of lip tints, and the radiant pigments of lipsticks to create this must have product. This lip product will melt easily onto lips and provide it with lasting pigmentation. Its funky hot pink color will help brighten up your complexion and add radiance to your look. My Thoughts: Okay, this thing is tiny and it's about half the size of the full product. I have a lot of lip products now and my favorites are the 3 in 1, or 4 in 1, or even 5 in 1 lip products. They last on my lips all day without bleeding off or losing its pigmentation. 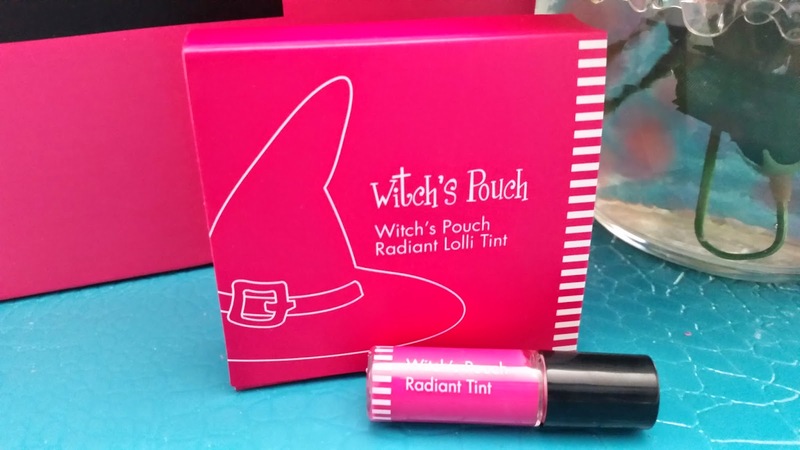 I will have to put this Witch's Pouch Lolli Tint to the test to see if it's just as good as it claims. I'm not sure if I like the color yet, but I think It'll make a great gradient lip! 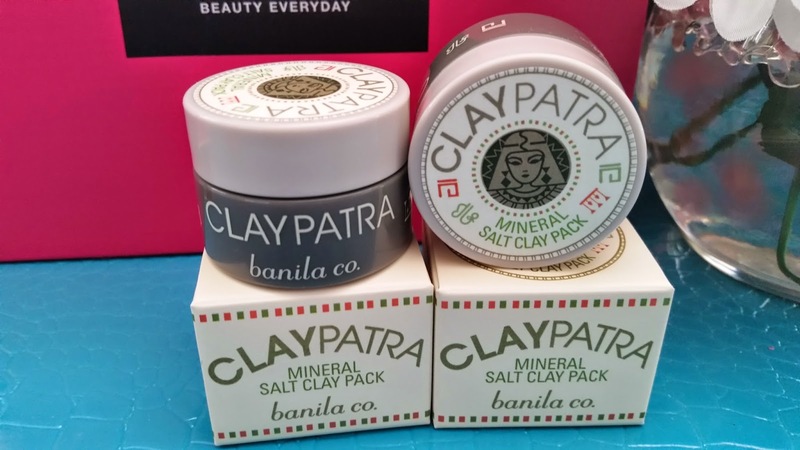 Product Description: This Claypatra Mineral Salt Clay Pack contains 100% pure mud extracted straight from the Dead Sea. It works to effectively remove excess sebum, oil, dead skin cells and pollutants clogged up in the pores. This clay pack has a mineral rich formula that will deliver hydration deep into the skin and send nourishment to moisten dry and dull skin. 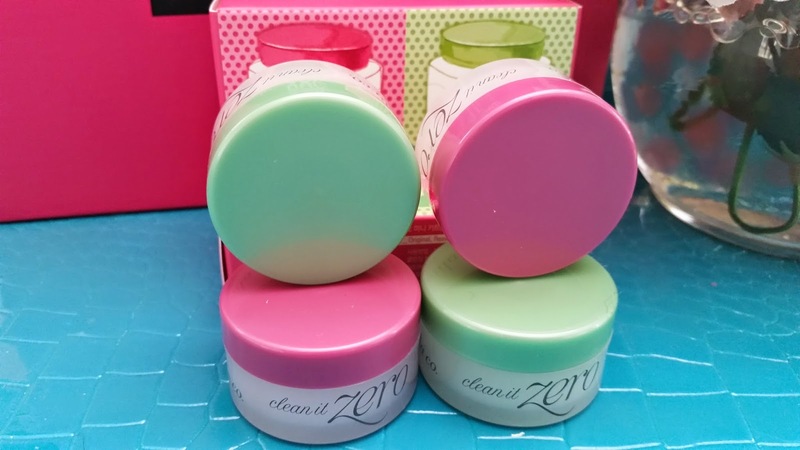 To use, spread the clay pack evenly over clean face and leave it on for 10 minutes. Rinse off with lukewarm water after and while rinsing, gently massage the face with your finger tips to help exfoliate dead skin cells. My Thoughts: Another sample I had hoped for in the Boxing Day #2 box. This is really a hit of miss clay pack for a lot of people, but I still wanted to try it. I love clay masks, especially Innisfree's Super Volcanic Clay mask, so I'm always open to trying a variety of them. I didn't want to purchase the full size because I was afraid my skin would either not react well to them or I wouldn't like them for any other reasons. Having these in sample sizes means I can patch test it without worrying about having to spend money on a full size product and might end up wasting it because it didn't agree with my skin. Product Description: This CC cream will deliver nutrition and moisture to your skin and create a smooth texture on it. It's a multi functional cream that will not only brighten up your complexion but also protect it from the sun and provide anti-aging properties. To use, take an appropriate amount and spread it evenly over clean and moisturized face. Blend it with with your fingers or a beauty blender for an even look. My Thoughts: Another product I had hoped for in this box. Its packaging is so unique, I wouldn't call it cute, but I like it lol. I always like to try new BB creams or CC creams or Foundations to find the best for my skin. So this sample size gives me the opportunity to do that without shelling out the money for a full size. Although, I still buy plenty of full size products to try, those products are generally ones I can find a full ingredient list on and have an idea of whether it will react badly with my skin or not. 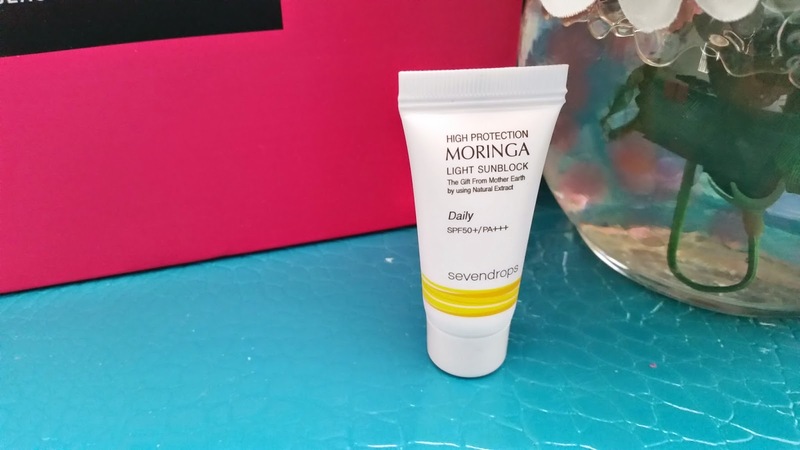 Product Description: This is a lightweight sunblock formulated with moringa extracts. It not only provides high level of UV protection, its light formula also absorbs easily and smoothly into the skin, almost like an essence. This sunblock has a light moringa scent as well, that lingers after application. The formula is free of paraben, mineral oil, benzophenone, silicon, and talc. To use, take an appropriate amount and spread it evenly over clean face and follow up with foundation or BB cream. My Thoughts: I kind of had a feeling that there would be sunscreen in here, and honestly I don't mind it since this is an awesome box! I haven't heard of this brand before, so I am excited to try it. My favorite go to sunscreens are from Shiseido, their Urban Envirnoment Oil-Free UV Protector Broad Spectrum SPF 42 (for face) and Ultimate Sun Protection Lotion+ Broad Spectrum SPF 50+ (for face and body). However, I'm always open to trying new ones, and if I can't use it on my face, I can always use it on my neck or body. Product Description: A 3 in 1 makeup base that has the functions of BB cream, CC cream, and foundation. It will not only correct skin tone and balance it out, but also blur it for photo effect and moisturize the skin as well. Plus, it adds silky smoothness to create the perfect 3D complexion look. To apply, take a pea size amount and spread it evenly over clean face. Apply a thin second layer to T-zone and under eye areas for brightening and highlighting effects. My Thoughts: This is another samples size product I had hoped for. Makeup base is something I look for all the time because I've yet to find the one that works perfectly for my skin. I currently use Lioele Dollish Viel Vita BB cream in green (which I love a lot) as my base, because it evens out the redness on my face, however it doesn't really make my pores look smaller or add brightening effects to it. Blur bases are so popular right now in Korea. With Etude House's new blur base product and this one, aimed at creating the perfect complexion that looks like you've used a photo filter on your face when you really didn't. I'm excited to try this product and compare it with other blur bases. Product Description: A sherbet like balm makeup remove that transforms into a silky oil form once applied onto skin. It's used as the first step of the double cleanse routine. This cleansing balm will effectively dissolve makeup and sunscreen with ease. Its gentle and non-greasy formula is enriched with papaya, acerola, and herbal extracts, which will cleanse the skin thoroughly without dehydrating it. To use, take an appropriate amount of the balm cleanser and gently massage it into skin. Rinse off with lukewarm water and continue to step 2 of the double cleanse routine. Final Thoughts: I love, LOVE this Boxing Day #2 box and wish I bought 2 instead of 1. The contents are amazing and the price is so worth it. I wish Memebox would do this more often. This was the first box in a long time that came pack full to the brim. It made me so happy when I opened it. I know I will be using/trying everything in the box except for the hair loss treatment. For $12 plus $6.99 shipping, this box came out to be roughly $77, which is just WOW. It's worth more than some Memeboxes with full size products. The usability and quality are definitely in this box as well and all 3 aspects makes this Boxing Day #2 box an amazing box and one of the best I've ever gotten. Did you get this Boxing Day #2 box? What are your thoughts on it? Glad you love the box! I wish Memebox would make more boxes like this one. I love the Dollish Veil Vita in green, it really helps with covering the redness on my face and my post acne marks. It can be worn by itself with maybe a bit of powder on top and it gives a natural finish. Or it can be worn as base, which is how I use it most of the time for work and events. I haven't found anything else that covers redness easily and doesn't look cakey, so I'd totally recommend it!